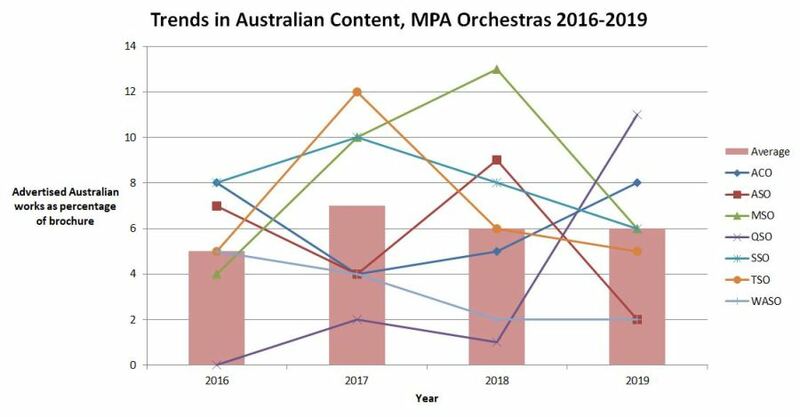 The Queensland Symphony Orchestra has topped Ian Whitney’s report on Australian orchestral content for 2019, with 11 percent of works programmed on its 2019 program written by Australian composers, a massive increase on its one percent in 2018. Whitney’s report, which the composer began in 2016, counts the works listed in the online brochures for each of the Adelaide, Melbourne, Queensland, Sydney, Tasmanian and West Australian symphony orchestras, as well as the Australian Chamber Orchestra. “If it’s not in the brochure, it’s not counted,” he says in the report, acknowledging that this means festivals, galas and outreach programs often don’t make it into the figures because of the lack of detail in the published brochures. The report has become a finger on the pulse of Australian orchestral content, providing a snapshot of the overall landscape delivered with what the composer describes as “the occasional snide observation”. Whitney includes his methodology with the 2018 report, acknowledging both the philosophy behind the report and its limitations. Neither the Canberra Symphony Orchestra (which is not funded as a Major Performing Arts organisation) or the Australian Brandenburg Orchestra is included in the report. The Australian Chamber Orchestra comes in second in 2019, with eight percent Australian content on its advertised program (also up from 2018) while the Melbourne and Sydney symphony orchestras come in equal third at six percent, with the Tasmanian Symphony Orchestra clocking in at five percent – all three down from 2018. The Adelaide and West Australian symphony orchestras are at the bottom of the list next year, both on two percent, with what Whitney describes as “a soul destroying collapse” from almost nine percent by the ASO in 2018 and an increase of point three of a percent from WASO. Whitney provides a quick snapshot of the number of works by women composers: 15 out of 644 advertised works, or two percent. Here the ACO leads with seven works, followed by the Queensland Symphony Orchestra with three. Whitney also touches briefly on the number of Australian works advertised by the opera companies, singling out the State Opera of South Australia, who have three Australian works on their 2019 season – 33 percent of their program – and Opera Australia for commissioning a new main stage Australian opera by Elena Kats-Chernin.